S I G N & D I G I T A L G R A P H I C S • August 2018 • 53 significant differences that help clarify what is expected for each type of install. The primary differences are on cutting, types of heat used and techniques needed to achieve professional results. 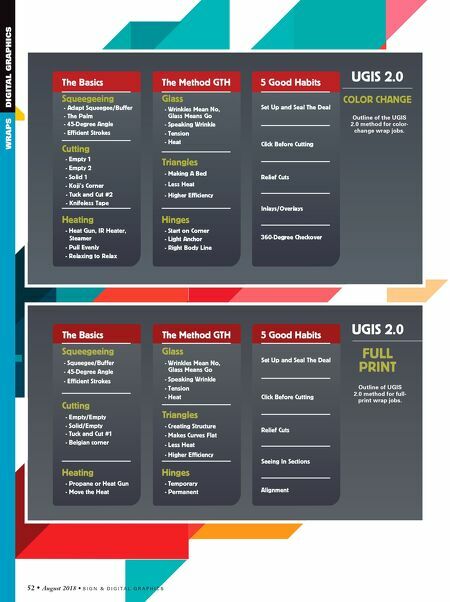 UGIS 2.0: Full Print and Color Change For cutting, UGIS 2.0 Full Print has four types of cuts: three for edges and one for corners. Very simple and straight forward like what digital full-print wraps should be as they are moving billboards. For UGIS 2.0 Color Change cuts, there are six types of cuts: five for edges and gaps and one for corners. These are more nuanced and precise because color-change wraps have to take the film deeper into the body of a vehicle and have higher quality. In UGIS 2.0 Full Print a heat gun or propane torch can be used while, with UGIS 2.0 Color Change, propane torches are out. Don't get me wrong, propane torches can be used for color change installs but they come at a high risk as they can gloss a matte finish for example. For UGIS 2.0 Color Change, IR heaters and steamers are added because the wrap films can be thicker, multi-lay- ered and have sensitive finishes. For GTH, the heart of both systems, there are significant differences between them. For UGIS 2.0 Full Print, tempo- rary and permanent hinges are used in order to make sure the graphics align properly. With color change, there is no need to align text or images, so the logic of UGIS 2.0 Color Change is more based on using body lines as starting off points and the "making a bed" technique. Simply put, GTH for UGIS 2.0 Color Change is geared more to help avoid adhesive lines and create a strong corner game. Positive Reaction I started pushing the updated ver- sions of UGIS last year during a two- week workshop run in Australia and I could immediately see a positive reaction from the installers. By defining what is expected in a full print and color change install and providing a clear system for each one, the confidence level soared. Instead of guessing what should be done, they knew what to do. 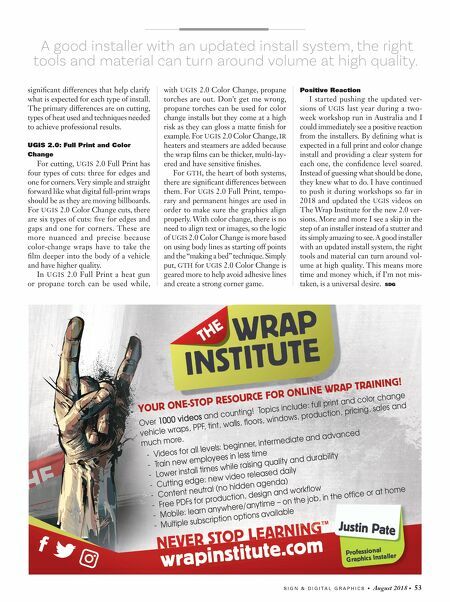 I have continued to push it during workshops so far in 2018 and updated the UGIS videos on The Wrap Institute for the new 2.0 ver- sions. More and more I see a skip in the step of an installer instead of a stutter and its simply amazing to see. A good installer with an updated install system, the right tools and material can turn around vol- ume at high quality. This means more time and money which, if I'm not mis- taken, is a universal desire. SDG A good installer with an updated install system, the right tools and material can turn around volume at high quality.